Sir Francis Holbourne, 4th Bt. Sir Francis Holbourne, 4th Bt. is the son of Admiral Francis Holbourne and Frances Ball. 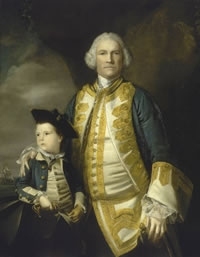 He gained the title of 4th Baronet Holbourne. [S466] Notices, The Telegraph, London, UK, 25 September 2009. Hereinafter cited as The Telegraph. [S7648] Natasha Vrecossis, "re: Clive Family," e-mail message to Darryl Roger LUNDY (101053), 11 July 2015. Hereinafter cited as "re: Clive Family." [S3615] Yvonne Oswald, "re: Brauer Family," e-mail message to Darryl Roger Lundy, 15 February 2009. Hereinafter cited as "re: Brauer Family."